I’ve had a fair amount of time to explore Nishinomiya during this first week, and while it may still be the honeymoon period of my year abroad, everything here seems fantastically idyllic so far. My host family has no car so we all cycle everywhere, and I’m loving exploring the city bit by bit – not in a rush as I would as a tourist, but instead with the expectation of being here long term. The scenery here is quite mixed. The view from my bedroom window is very urban (at least for me) and there are definitely areas where, for instance, huge shopping centres abound, but then all throughout Nishinomiya are scattered little patches of farmland as well as huge swathes of residential areas which have a very village-like feel to them. On top of that, the city is also flanked by the sea on one side and mountains on the other, meaning that the air is very fresh. My photos really don’t do it justice! 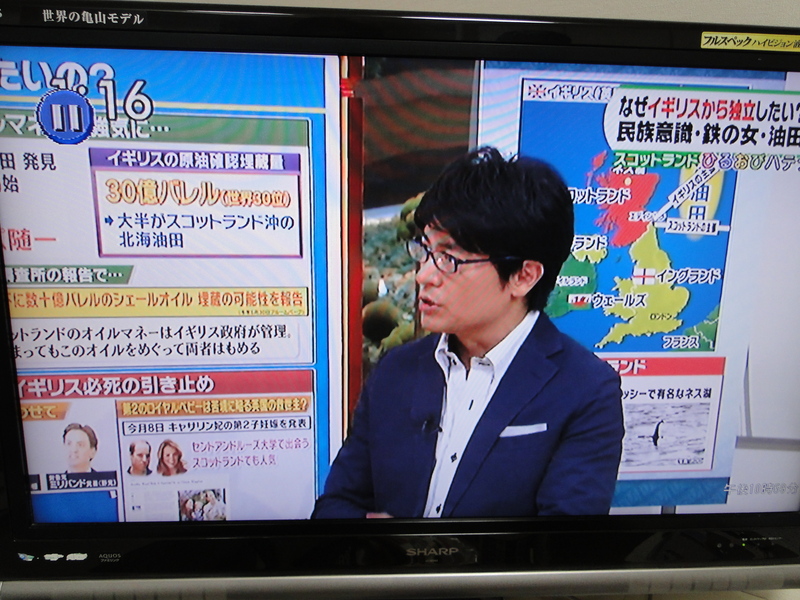 In the middle of all of this (according to my shaky understanding of the local geography) is Kwansei Gakuin. Although the university buildings are definitely not inspired by traditional Japanese architecture, the campus is very picturesque. Compared to Edinburgh it’s much more uniform in appearance, but like everywhere else is very well kept and a pleasant environment in which to be studying. This first week – which has been completely focused on orientation – has involved a fair few sessions doing things like sorting out health insurance, but still, it’s been a good chance for everyone to get their bearings and hopefully make some new friends. Being in a homestay I haven’t had so many chances to spend time with the other exchange students, but the few I’ve got to talk to a bit more have been really friendly and this weekend some of us are going to go camping with one of KGU’s circles (university societies)! Before this weekend, however, there’s tomorrow to think about. Not only is it the day we find out which way Scotland has voted in the referendum (more on that next time) – it’s also the day we exchange students find out which class we’ve been put in for Japanese. There are over 100 exchange students here, some of whom are taking intensive Japanese language classes and some of whom are opting for a less intensive track which gives them more freedom to study other subjects like Japanese and East Asian politics, religion, history and so on. Students like me from Edinburgh could technically go into either track, but in order to really improve our level during 3rd year we’re strongly encouraged to opt for the intensive one. This being the track I’ve selected, I could be placed in any of 6 levels of class, from beginner to advanced. I’m hoping to get into either level 4 or 5 (5 being pre-advanced), and the placement test earlier this week went fairly well, but I guess we’ll just have to see! Language classes aside, another way the university plans for us to learn Japanese is through the Nihongo (Japanese language) Partner programme. This programme involves KGU students volunteering to help exchange students improve their Japanese, and while I only have one Nihongo Partner, since most people have two that means there are about 200 students volunteers. I think we were all surprised when we walked into the (very large) classroom to see that many people waiting for us. Having come across other similar programmes before in which it has always turned out that most students who volunteer really just want to practise their English, I was a little bit sceptical at first, but it turned out in my case at least that my Nihongo Partner is genuinely happy to speak only Japanese, which is brilliant! She is also incredibly friendly, and the couple of times we’ve met up I’ve come away feeling like I’ve already made so much progress. Although I’m probably just talking a lot of nonsense a lot of the time, they do say that children learn faster because they’re not afraid to make mistakes, so the no fear approach is the one I’m going for! It’s amazing how much more you pick up when a) you stop worrying too much and b) you really have to learn new vocab and so on in order to communicate with the people around you. A little aside here – as always – about food. A highlight of this week was going with my Nihongo Partner to use one of the university canteens for the first time. Japanese university canteens are honestly a place of wonder. 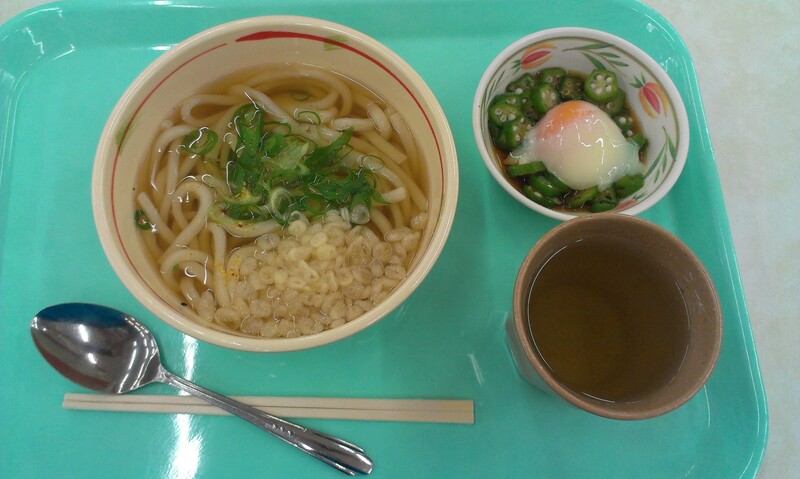 This is what I had on Wednesday for only ¥254 – around £1.45 – and it was delicious! The canteen, by the way, was called Big Papa, but since I’m reliably informed Big Mama is even better I’m very much looking forward to going to eat there next week when it reopens! Just as my Nihongo Partner has been supremely kind and helpful, my host family are also playing a huge part in making me feel welcome here. Being optimistic, my expectations had been that if I was lucky I’d end up with a nice family who spoke a lot of Japanese to me, but having heard from everyone that homestay students – especially girls – are invariably wrapped in cotton wool, given strict curfews and generally not allowed much freedom, I was both hugely surprised and relieved to find myself with a family who strike a great balance between including me in things and also giving me my own space and responsibility. I don’t even have a curfew! In order to respect the family’s privacy I’m not going to write too much about them here, but I don’t think it’s giving too much away to say that they are made up of a couple with a son and daughter aged 7 and 2. In fact, the son’s 7th birthday was the day after I arrived, and although there wasn’t the same amount of fuss made as probably in most households I can think of back home, there were presents (Pokemon toys!) and cake, and we even had some helium balloons delivered in the post which are still floating round the living room.